At first glance, Jesse and Kelly Cottle, of San Diego, Calif., look like any cute couple in love. 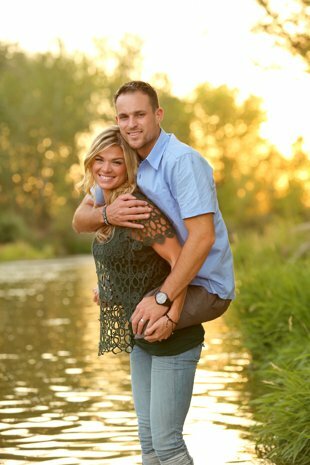 But take a closer look at this photo of Kelly giving husband Jesse, a marine and double-amputee, a piggyback ride, and it's clear to see why the picture has gone wildly viral. Jesse, 28, lost both of his legs in Afghanistan in 2009 after stepping on an IED, which was all caught on video by a fellow marine wearing a helmet camera. The footage was even used in a documentary about Jesse called "Coming Home." "If I hadn't stepped on that IED I wouldn't have met her," Jesse told ABC News. "I wouldn't take it back ever." After spending months recovering in the hospital, Jesse met his future wife Kelly, 24, in San Diego at a swim meet during one of his first outings with his new prosthetic legs. "His personality and who he is just outweighs his injuries by so much that you forget about it after a while," Kelly explained. Recently, the couple took a trip to visit Kelly's family in Boise, Idaho, where they decided to have a family portrait taken. "Someone had suggested taking photos in the water," said Kelly. "I was carrying Jesse back to his legs, and the photographer was like, 'Oh we'll get a couple of shots of you together.' It wasn't planned or anything." The photographer, Sarah Ledford, posted the picture to her Facebook page, where it immediately started gaining attention, racking up more than 7,000 likes, more than 500 shares and getting countless comments, all in awe of the couple's strengths and resilience in the face of adversity. "It's an amazingly inspiring story that has touched the lives of many Americans," Ledford said. "Jesse is not a hero for stepping on an IED, he's a hero because of the way he has handled what was handed to him and how he chooses to continue to conduct his life with his positive attitude." "The photo really says it all," Jesse added. "I actually look at it very much as a symbol for our whole relationship in general. She's physically carrying me, but there's times where she's carrying me emotionally. It's a perfect representation of who Kelly is." The happy couple just celebrated their first wedding anniversary on Aug. 18 by eating the top layer of their red velvet wedding cake.